Dear Brother Knights & Ladies, I am reporting officially to you this matter of urgent national and particularly CATHOLIC concern: The change of Maria Assumpta Avenue, Owerri to Muhammadu Buhari Road by the Imo State Government. I said officially because at the invitation of His Grace, Archbishop Obinna of the Owerri Catholic Archdiocese, I joined a high-level meeting that he chaired on the matter after Mass on Sunday, December 24, 2017 at the Maria Assumpta Cathedral, Owerri, Imo State. I therefore have the mandate of the meeting to alert the KSJI at the national level and also to brief the KSJI SSP and SSP Ladies Auxiliary. The decision was that all Catholics in Nigeria should be alerted which is why this post here, however, I shall deliver some reserved details directly to the SSPs KSJI & Ladies Auxiliary. An imposing/conspicuous brick-board has already been erected directly facing the entrance of the Maria Assumpta Cathedral, Owerri to herald this new MUHAMMADU BUHARI ROAD. For those who know Owerri very well, Maria Assumpta Avenue is the expressway in front of Maria Assumpta Cathedral, leading to Owerri City Centre from Owerri – Port Harcourt Road and also intersecting Owerri – Onitsha at the entrance of the Cathedral. It is a strategic road that channels all traffics from Port Harcourt and Onitsha directions into Owerri City. Maria Assumpta Avenue is as old as the Maria Assumpta Cathedral itself. Maria Assumpta Cathedral is not only the greatest man-made strucure in old Owerri, and perhaps still so in modern Owerri and therefore is of monumental historical significance to Owerri people in particular and Imo State in general but it is also a CATHOLIC edifice of a ‘world heritage’ status. To now locate such an edifice on a road that bears the name of an Islamic leader has been interpreted by the Church as a desecration of the Catholic Faith and by extension, Christianity and what it holds dear the most. Ironically, the roundabout at the entrance of the Cathedral where the new name of a road was erected has a giant monument of the Holy Family. 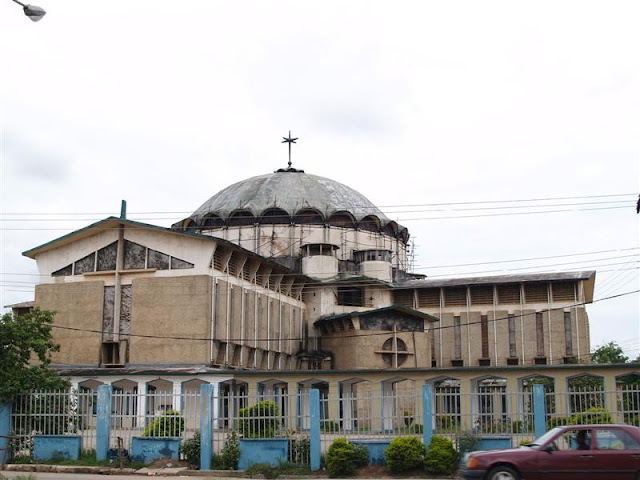 Maria Assumpta Cathedral is not just for the Owerri Archdiocese but it is also the headquarters of the Owerri Ecclesiastical Province which extents to Abia State. Catholics in Owerri, especially parishioners of the Cathedral, had a sad Sunday and boiling is the right word to describe the feeling of the Church right now. His Grace the Archbishop of Owerri in his homily described the development as an insult to the Catholic Church, a slap on the face of the Holy Family, and a disrespect to Holy Mother Mary whose name is on the Cathedral. Therefore, logical reactions have been planned and Catholics nationwide are required to be part of the action, but most importantly not to work at cross-purposes. Rather, they are to seek accurate information/updates and work in accordance only with the Church. As I remain a member of the Archbishop-led Committee, I will do what I can to send in updates here when necessary. Our SSPs will also be direct leaders in this struggle and will equally provide leadership and information as they deem necessary. For the avoidance of doubt, the Catholic Church is not opposed to naming ALL the roads in Owerri after His Excellency, President Muhammadu Buhari, if the will make the Imo State Governor happy and help his political aspirations, BUT it can never be the Maria Assumpta Avenue. Therefore, the reaction of the Church has nothing to do with politics or even Islam but simply the preservation of its own Faith and heritage. St. John the Baptist… Pray for us.